Mrs C is Ellen’s mum. Ellen is the soon to be married fiancé of my soon to be married Brother. Luke and Ellen have yet to arrive from New York, but we get up early to catch Mrs C for breakfast before hitting the road. She’s already with Joe and Kate in the hotel lobby, who both met her when they visited New York last Christmas. “Robert, Robert, Robert” she welcomes me in with her cheery southern lilt. 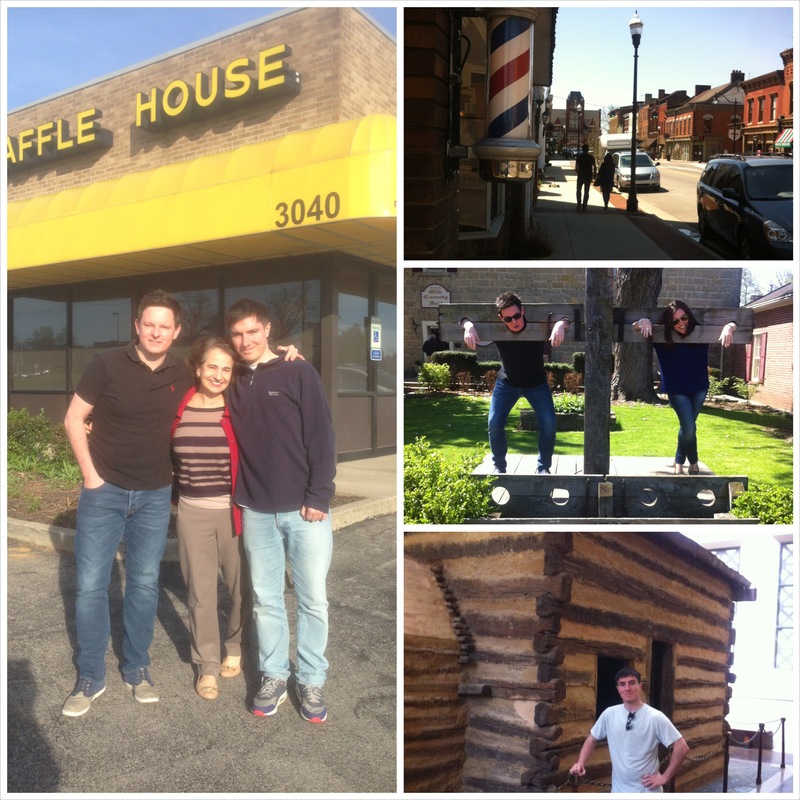 We head to the nearby Waffle House for the all-American breakfast. Even this early in the trip I know the phrase “all-American” will be used as a lazy expression to describe anything that we’re familiar with solely from the world of Hollywood films. Breakfast with Mrs C is just what we’re after, as she fills us in on the wedding plans and what to expect at the upcoming event of the year. Given we’ve got suit and shirts which would have little chance of surviving a pre-wedding weekend tour in a suitcase, she’s kindly offered to look after our wedding get-up until we’re back in Lexington in a weeks time. We head out to Bardstown, a town where time has stopped. Very much like the fictional Castle Rock from Stand By Me. In fact we’ve been overcome with comparing everything to films on this short drive from Lexington. Every passing farm barn is the one from Jeepers Creepers, every white picket fence is from a range of US suburban films. Even the option for “grits” at breakfast stokes memories of My Cousin Vinnie. We also make an effort to see Fort Knox. It’s an inaccessible security vault, famous for barbed wire fencing and “no photo” signs. Kind of surprising why it’s a tourist attraction at all really? But still we did the 50mile detour, as it apparently featured in a James Bond film none of us had ever seen. Next on the hitlist was the birthplace of Abraham Lincoln, which is just south of Fort Knox and accessible via Elizbethtown. Here you’ll find a beautiful woodland area centered around a memorial building that encases a hut similar to the one Lincoln was born in. In 1894, a New Yorker purchased Sinking Spring Farm and moved the log cabin that he believed to be Abraham Lincolns here. He believed that former landowners had initially moved it, and this was the original spot. In the late 1800s it was dismantled and taken on tour by a travelling road show, before ending up in New York where it was deconstructed and left in somebody’s basement. It was then bought back by the Lincoln Farm Association after a huge fundraising mission, with the cabin being scaled down to fit inside the memorial building. In the latter years, tests proved that it was highly unlikely to be the actual hut of Lincoln, but sod it, don’t let the truth get in the way of a good story. Kentucky produces the world’s bourbon, the finest racehorses and the most unique countryside. But so far we’ve mainly concentrated on a few old barns, a giant safety deposit box and a reconstruction of a mud hut from a travelling circus. I just hope that one day somebody will reconstruct a suitably sized version of Edgware Maternity Ward to mark by early beginnings. White picket fences. Rolling green hills. Clock towers. What’s not to love about crazy golf? And where better than Cave City to satisfy this need. It’s home to several courses. People may say “but you can do crazy golf anywhere”. But really, when was the last time you played? Cave City is a tourism town that sits just outside of the Mammoth Cave National Park. It’s mainly one long road that is flanked by fun-for-all-the-family institutions and fast-food joints. For a bright and sunny day the strip is extremely quiet. There’s supposed to be a Cowboy shoot-out when we arrive but eerily there’s no sign of any existence. Why aren’t the crazy golf courses open? I know it’s a Thursday afternoon, but where else can you play 9-holes with your Grandma in under an hour? And so we look for alternatives, though unsure we really want to step out of the car into this town. At one end of the road sits Dinosaur World. The other, atop a slight hill, the Haunted House amusement ride. Not sure what 150 life-sized dinosaur models would bring to our trip, we decide to head up towards the house. Despite the ‘open’ sign, The Haunted House is obviously closed for business. Though perhaps looks scarier than the original designers had ever imagined it, laying here in the afternoon sunshine. Next to it is a chairlift, which has evidently succumbed to rust and a lack of interest. The sign suggests visitors can take this up the mountain where they can then slide back down via a ¼ mile alpine slide. However, while most of the chairlift is in place, there’s no evidence to suggest any fun as been had here in years. The last recorded evidence can be found on this family video footage (c.2008). After a closer inspection of the Haunted House, I notice a truck from a parking lot further down the hill creeping up towards our car below, the sunlight reflected from his front grill catching my attention. Not keen to get blocked in, we head back down to the car. The drivers keen to know what the hell we’re playing at, but is okay when he sees we’re tourists. According to him, the main attractions have been through hardship of late. The last owners went bankrupt following dwindling visitor numbers, however he’s optimistic that when summer comes, so will the paying public. He’s owns a small convenience store on the main strip. 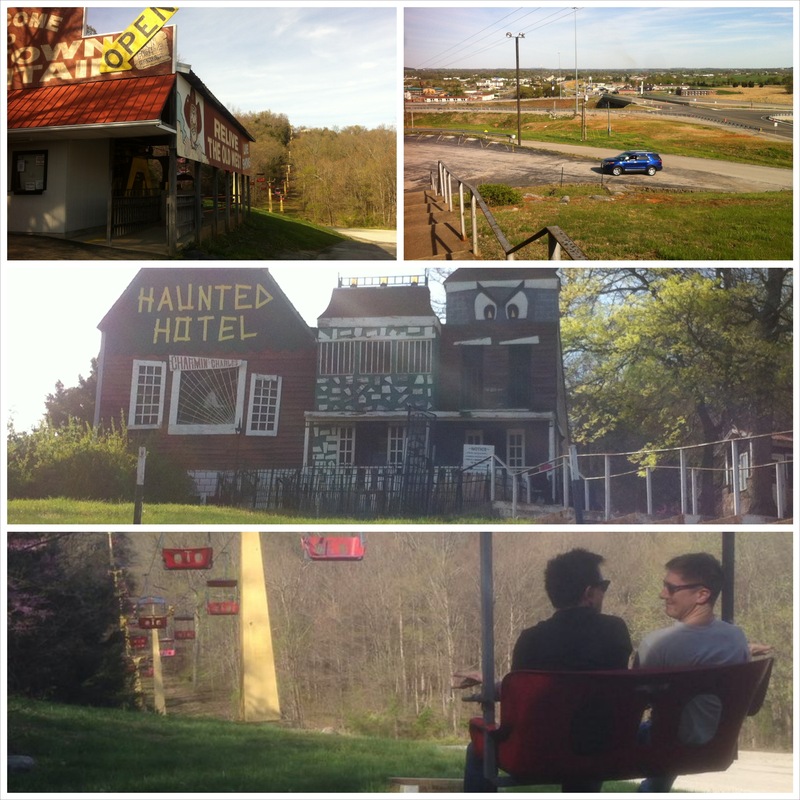 Having given up on good organized fun, we pulled out of Cave City and delved into the Mammoth Cave National Park to check-in to our hotel, the Mammoth Cave Hotel. After dumping our bags off just after 6pm, we head to one of the entrances of the nearby caves to do a bit of bat spotting, but are a tad too early. After dinner at the hotel we head back out to Cave City where we’ve been told, according to one of the local rangers, sit a few decent hotspots for a nightcap. We’d anticipated an all-American tavern complete with pool table, neon Budweiser signs and a big hairy biker grinding his younger biker chick. But what we got was El Mazatlan, a Mexican restaurant chain, one of only two restaurants/bars in Cave City with a liqueur license. Though actually this is no huge surprise given local voters only passed a referendum allowing bars and restaurants to serve alcohol in November 2005. Providing they meet certain criteria, restaurants were able to serve alcohol for the first time in 50 years. So we decided best to head back and get an early night for the cave tour tomorrow.